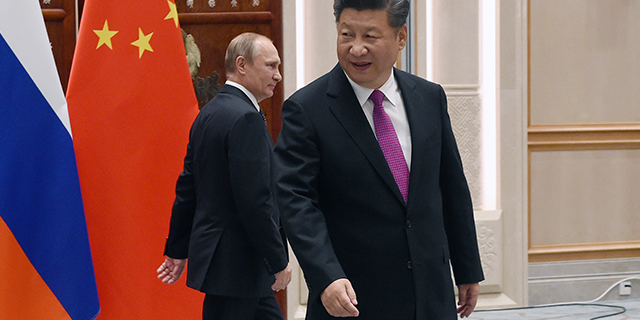 Do the Russian and Chinese governments respect the personal freedoms of their people? Your opinion may depend on where you live. People who live in countries where the political system is less than “fully democratic” tend to give Beijing and Moscow higher marks for upholding individual rights than people who live in full democracies, according to a new Pew Research Center analysis of public opinion in 38 countries across the globe. The definition of a “full democracy” comes from the The Economist Intelligence Unit’s Democracy Index, which also characterizes political systems as “flawed democracies,” “hybrid regimes” or “authoritarian regimes.” The EIU considers civil liberties when constructing its index, and countries with fewer protections for these freedoms are more likely to receive lower index scores (a full list of the countries included in this analysis and their EIU Democracy Index ratings can be found here). 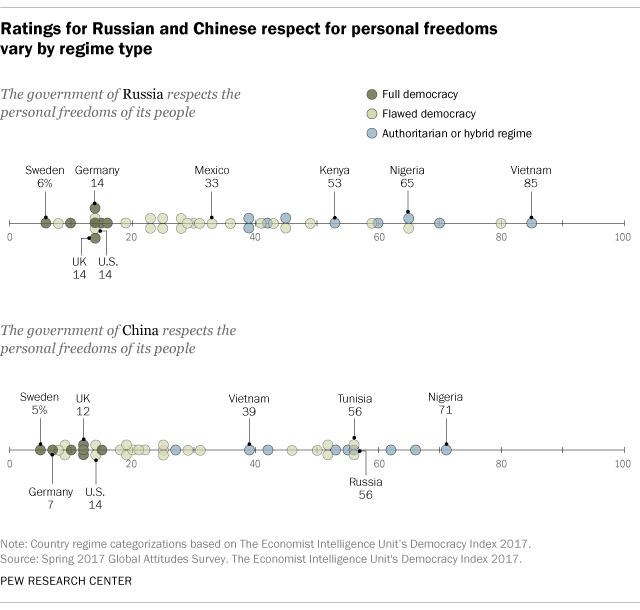 In the nine countries surveyed by Pew Research Center and categorized as either hybrid or authoritarian regimes by the EIU, a median of 55% say China respects the personal freedoms of its people. Across the 22 flawed democracies polled, that median slips to 23%, and it falls even further among publics in the seven full democracies surveyed (12%). Views of Russia’s respect for personal freedoms follow a similar pattern. Most people living under hybrid or authoritarian regimes (a median of 53%) say Moscow upholds the individual rights of Russians. Those living under more democratic regimes disagree. 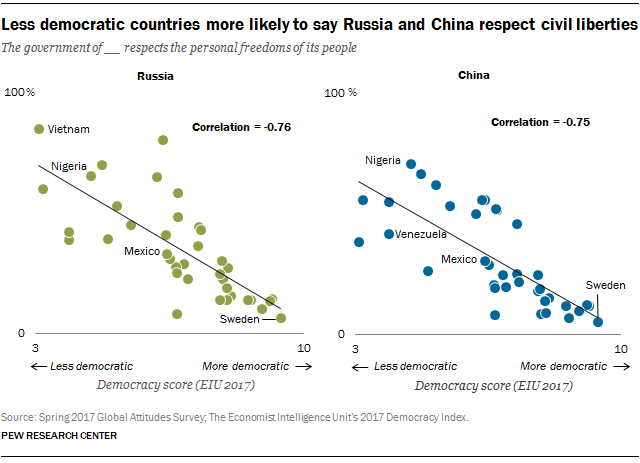 A median of just 30% of people in flawed democracies say Moscow respects the personal freedoms of its people, and the share is considerably lower (14%) in countries described as full democracies. The relationship between EIU ratings of democratic governance and public views of whether Russia and China uphold individual freedoms is quite strong (a correlation of -0.76 for Russia and -0.75 for China). The relationship between regime type and views of the government’s respect for civil liberties is much weaker when it comes to two other large and influential nations: the United States and France. A median of half or more across each EIU regime type say the U.S. and France uphold the personal freedoms of their people. France gets much higher ratings (median of 72%) than the U.S. (50%) among the full democracies surveyed. 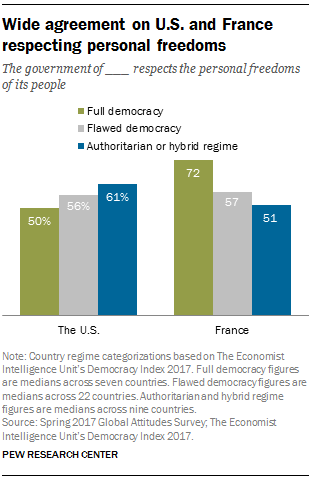 People in flawed democracies give the U.S. and France similar ratings when it comes to personal freedoms, and authoritarian and hybrid regimes tend to give the U.S. slightly higher ratings than France. However, people living under authoritarian or hybrid regimes are more likely to say they don’t know whether France upholds personal freedoms: A median of 19% give no opinion, compared with 10% who give no opinion of the U.S. government on this question. Note: See topline results, methodology and The Economist Intelligence Unit’s Democracy Index scores for countries included in this report here (PDF). Dorothy Manevich is a research analyst focusing on global attitudes at Pew Research Center.